Dame Valerie Jane Morris Goodall(born 3 April 1934), is a British primatologist, ethologist, anthropologist, and UN Messenger of Peace. She is well-known for her 45-year study of chimpanzee social and family interactions in Gombe Stream National Park, Tanzania, and for founding the Jane Goodall Institute. Known for her work with Chimpanzees in Tanzania, Jane Goodall had a whole other approach to the way she studied animals in the wild. With patience, noted observation, and becoming nearly a member of the social organization, Goodall was enthralled with providing documented proof that Chimpanzees did, in fact, have a deeply rooted social structure and hierarchy. In her late teens, Jane had decided she wanted to find a way to get to Africa. Rejecting the idea of a traditional education, she worked various jobs, but always with the same deep interest and love for animals. At the age of 26, she had her opportunity to go to the Gombe National Park near Lake Tanganyika. She had a hard time convincing officials that she would be able to survive on her own, so her mother went along and the trip proved to be exactly what Jane had been longing for. Little did anyone know she would stay in the area for more than 20 years. Goodall worked with Louis Leakey, who chose her to watch over the different species of chimps, gorillas, and orangutans in the area, as she would have a “pure and undiluted” perception about what the animals were doing and how their social system was arranged. Her lack of formal university training actually worked in her favor. After spending months of gaining the trust of her subjects, she was able to mold herself into their social system. She was able to note the differences that each one had in regard to personality. She also noted that the chimpanzees were less violent than previously thought, although several years later she witnessed a war between two groups in which one group annihilated the other. Jane Goodall also noticed that the chimpanzees used tools to extend their own bodily capabilities, such as using sticks to catch termites and grasses that would aid in their omnivorous efforts. For these observations and after returning to England several times in order to complete her reports, Goodall earned a PhD from Cambridge, one of the only to do so without having obtained an undergraduate degree. In the latter 1970s, Goodall started the Jane Goodall Institute for Wildlife Research to help raise funds so that others could continue her work. This institute would also fund research elsewhere in the world. In the 1980s and into the 1990s, Goodall started the Committee for the Conservation and Care of Chimpanzees who were being used for research studies. She called for better care, conditions, and conservation. In her life, Jane Goodall won many prestigious awards, has written several articles, and done several documentaries with National Geographic, which she won the Society’s Centennial Award. She has also been awarded the Kyoto Prize, the Woman of the Year Award, and the Tyler Prize for Environmental Achievement. 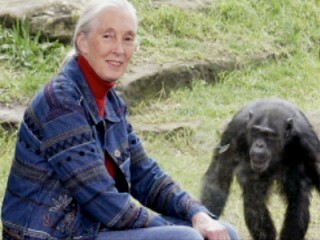 In 1977, Goodall established the Jane Goodall Institute (JGI), which supports the Gombe research, and she is a global leader in the effort to protect chimpanzees and their habitats. With nineteen offices around the world, the JGI is widely recognized for innovative, community-centred conservation and development programs in Africa. Its global youth program, Roots & Shoots began in 1991 when a group of 16 local teenagers met with Goodall on her back porch in Dar es Salaam, Tanzania. They were eager to discuss a range of problems they knew about from first-hand experience that caused them deep concern. The organisation now has over 10,000 groups in over 100 countries. Today, Goodall devotes virtually all of her time to advocacy on behalf of chimpanzees and the environment, travelling nearly 300 days a year. Goodall is also a board member for the world's largest chimpanzee sanctuary outside of Africa, Save the Chimps in Fort Pierce, Florida. Goodall has received many honors for her environmental and humanitarian work, as well as others. She was named a Dame Commander of the Order of the British Empire in a ceremony held in Buckingham Palace in 2004. In April 2002, Secretary-General Kofi Annan named Dr. Goodall a United Nations Messenger of Peace. Her other honors include the Tyler Prize for Environmental Achievement, the French Legion of Honor, Medal of Tanzania, Japan's prestigious Kyoto Prize, the Benjamin Franklin Medal in Life Science, the Gandhi-King Award for Nonviolence and the Spanish Prince of Asturias Awards. She is also a member of the advisory board of BBC Wildlife magazine. In 2002, the Canadian city of Greater Sudbury, Ontario dedicated a walking trail, highlighting some of the city's efforts to rehabilitate environmental damage from the local mining industry, to Goodall. On 7 July 2007 Goodall presented at Live Earth. In April 2008, Goodall was awarded the Montana State University Medal for Global and Visionary Leadership. - 2006: Received the 60th Anniversary Medal of the UNESCO and the French Légion d'honneur. View the full website biography of Goodall Jane.